Darren Vonk: The Revelations Alaska Range. Flying into Anchorage for the first time as a Alpine climber is intense. Myself, Ian Welsted and Kris Irwin Received the John Lauchlan Memorial Award this year to go climbing in the Revelation Range Of Southwest Alaska Range. We land at 1Am on April 2/14. Book into the Captain hook hotel(unexpectedly) for a night of restless sleeping and were off in the early morning for a few items at AMH and Breakfast At Middle way Cafe on W Northern lights (tasty breakfast burrito)! Were off back to meet Our shuttle to Talkeetna. Gary From "Go Purple Shuttle" picks us up on time and we cram our duffel and ski's into the van and were off, Heading north to Wassilla to stop at Carrs and do our groceries for our 3 week stay in the Range. Gary waits patiently as we frantically run through isle many times filling carts and emptying the shelf's. 1.5 hours later we think we have got it handled. The check out takes just as long to get through. one last stop at the Adult Beverage shop and were in, locked, strapped and driving to Talkeetna air taxi. Screaming into the parking lot at 5pm we are hopeful to get a flight into the Revelation glacier still that same night. We weight in sign in gain some more fuel for the stoves and Paul fly's us in one smooth swoop. Recap: Arrive in anchorage at 1am on the 3rd setting up camp on the glacier at 8pm on the 3rd..... Wow that happened with out a hitch. We fly in and the french team that just spent a solid 2 weeks in there is surprised to see us a day early. They had great success on some routes in there to with some excellent weather. They pack up quickly and jump into the plane and fly out with Paul. 9am. Were alone blue ski's big granite peaks with multiple routes primed for the picking and we are wide eyed. Kris Irwin, Owner and active guide of "Rockies Ice Specialists" Spots the line and we pack out bags. Melt some water and have a bite to eat. hit the bags by 11pm and set the alarms for 5am. Beep.. Beep.. Beep we wake up rather fast, stoke is high and the white gas is roaring to life, 6 liters and oatmeal has us literally running out of camp and up a snow field for the first taste of Revelation Granite. Kris racks off and is gone before we know what hits us. 4 Pitches of fun moderate ice and Névé climbing. Kris's block is done for a while, meaning its all mine. I tie in grab the rack and im outa there, Climbing and laughing at how good it is, moderate fun with 3 good dudes. Excellent. 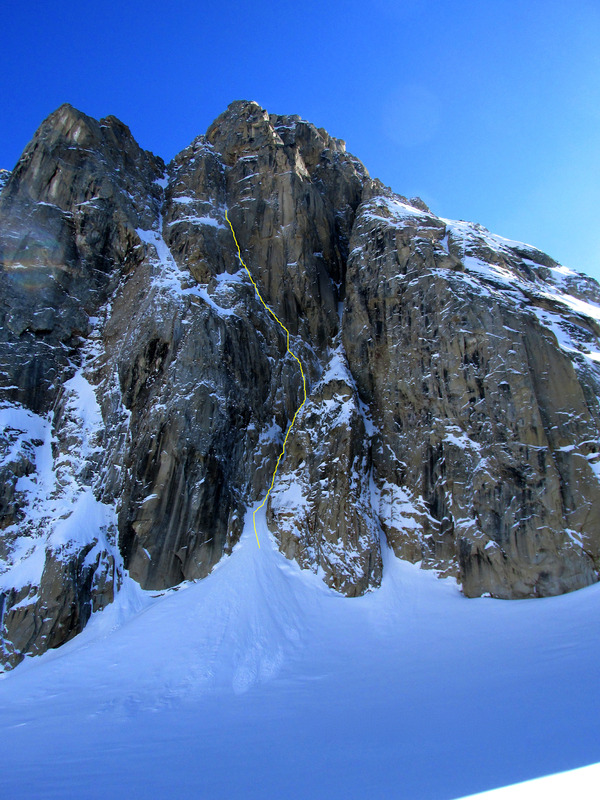 Pull some great pure rock moves and establish a belay at the base of a ice pillar! Spectacular. This is simply the top of the buttress, the summit looms well in the distance after a long ridge separating us from the true summit. We brew up and talk Strategy. Kris is the determined one in this decision, Off we go, He takes the lead and were off, weaving and bobbing to the summit of Mt Angle, Via a new route: John Lauchlan Memorial Award Route (1,200m, AI4+, M5). We descend well into the night and back to camp in the early hours. The revelations have really welcomed us immediately! We rest for a few days and ski around looking at our options, Needless to say there are endless. Kris Irwin in the meat of this squeeze chimney. That's it for this day. We rappel unwilling to re-lead a few of the pitches this trip, the route remains undone and primed for a party wanting a aesthetic route! Our attempted route on the 3rd Horseman. 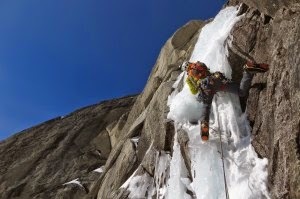 Ian spots a cool looking line, ice that weaves back and forth like a "S" On unclimbed Dike peak. Early morning has us skiing downhill at 5am! Now that's how to wake up. Stash the ski's and hike up in threatening clouds and slight winds has us thinking twice, Sure enough the upper head wall releases small spindrift avalanches and we retreat hastily. Its not the day. However we look across the valley to another aspect and a line we spied the other day. Hey! Ian yells, lets salvage the day, it is only 6am after all, We ski across the valley and a few route finding fudges has us at an unlikely looking pitch. Ian has a well trained eye and he finds ice and gear and were off, 7 pitches up a fun buttress on Mt Churub, I'm laughing my way up a ice vein when I get Rocked by a large spindrift in the middle of putting in a ice screw, I hang on with one tool and proceed to blindly refined the screw which is half way in and twist it all the way in, still getting pummeled I grab a draw and somehow find the hole to clip it into, it stops and i clip the rope just in time for round 2! This is bigger and feels like it might tear me off, lasts longer and i am actually having trouble getting breath. Yikes!! It stops and I climb ice faster then i ever have to a big overhang where i build an anchor and take some well deserved breaths.. Its time to go, The slope that produced these small sloughs were relativity small and benign in angle. A eye opener. Were happy to rappel, to have gotten some climbing in, but not worth continuing with winds and clouds moving in through out the day. we get some more small slides through out the decent and were down safe. A skin back to camp has the day complete. Few days rest and were well into our second week now, We think we should go give the route we came to do a try. Mt Pyramid central gash 1500m W-SW Face. We pack for a night up there and were off, A downhill ski again and a skin up a glacial bench has us stashing out ski's again and book packing up the left side of a big snow cone, Pitch after pitch of steep snow and ice bring us to a bunch of back to back mixed pitches. It starts to snow extremely lightly and the face starts running with spindrift, we bail. fast... seems the route needs some time to adjust. A few days of stable calm weather has Dike peak looking prime again. We go up and the route goes with moderate difficulty and blue sky's. 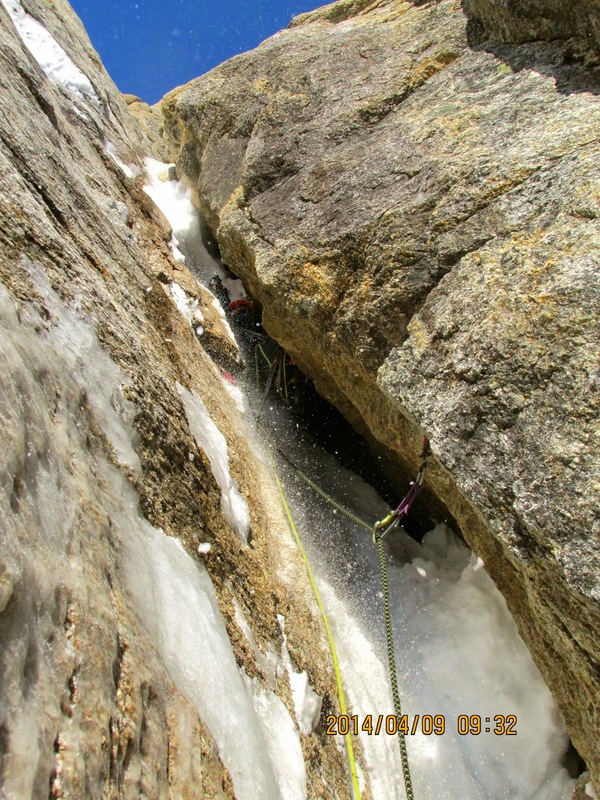 Pitch after pitch of ice that in the Rockies would never be climbable. A big snow gully and a Dyke pitch which climbs surprisingly well and protects even better. A chock stone and snow fields bring us to the top. 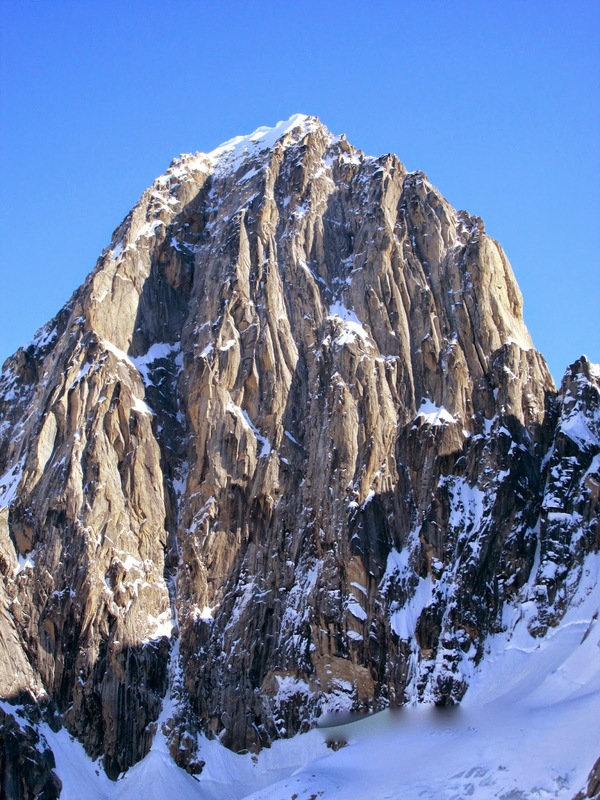 Unclimbed Dike peak. Were happy, but there is a storm brewing so were off as fast as we got there, 3 long raps in to a gully has us walking/running down this gully in pure pleasure. Easiest decent iv had in a long time! We wake to sunny sky's and calm conditions. Perfect day for a "casual" outing. Mt Hydra, at the south west corner of the revelation circ. We leave camp at 10am! ski up valley for a hour and climb a big snow coulior, 6 interesting pitches has us meeting the ridge early evening and summiting just a hour later. Another casual Walk down big snow slopes has us back at the ski's and racing back to camp with a tail wind! The Casual Route (600 meters, AI4 M6). Time is coming to an end in less then a week now. Time for another shot on Pyramid Peak route. weather has been stable, no new snow little to no wind, seems like it the stars aligning. Were off early re-climbing the same blocks as we did originally for speed, although a good idea, the route sports all new snow from slides and ice deterioration from the evening sun we have been having. Some pitches take just as long if not longer.... We get to out high point and we push a few pitches higher. we get to a lateral snowfield which we could see from base camp and decided that would be camp. Kris starts to establish a tent platform and I lead another pitch and fix the ropes for the morning. we settle in for a night up high and have dinner and water. Morning dose not come fast enough and I'm jugging the ropes to get to the belay, bring up the boys, and I'm off on my last pitch of the block. Over hanging snow and bad ice has be fighting for upward progress, at least there is good gear as I commit to a hook pull, lock off find the next hook and that has me flying backwards.. hanging on the ropes I lower back to the belay and Ian gives the pitch a try, No luck a lot of cleaning and struggling smooth granite walls dose not produce any aid climbing options, we bail. Tough decision. The Line on Pyramid Peak Takes the obvious gash just left of Center. After Rappelling for some hours we reach out ski's, nice to be back in the sun. We hear a rumble, look back and a cornice breaks off and starts a full height avalanche. Runs the full length of the Gully we were just in and slides down the Snow cone at the bottom of the route....... Wow, we were all in shock. We called Paul and he flew in 2 days later to pick us up. Weather was getting to hot and with the Revelations low elevation it was truly falling apart. Spring is here. As it is we competed three new routes, made the first ascent of Dyke Peak, climbed about 65 technical pitches in three weeks, and visited a range which is sure to draw more interest from climbers and skiers in the future. Thanks to our Award and sponsors for making this a truly Amazing trip.